John Carmack, best known for his work on iconic games that include Quake, Doom, and Wolfenstein 3D, today took to Facebook to share details on his interactions with Steve Jobs and to provide some insight into Jobs' opinion on gaming, what it was like working with Jobs, and what it felt like to participate in one of Jobs' famous keynotes. Carmack first interacted with Jobs when Jobs was still at NeXT, because Carmack wanted to add a "Developed on NeXT computers" logo to the original Doom game. His request was initially denied, but later Jobs changed his mind. 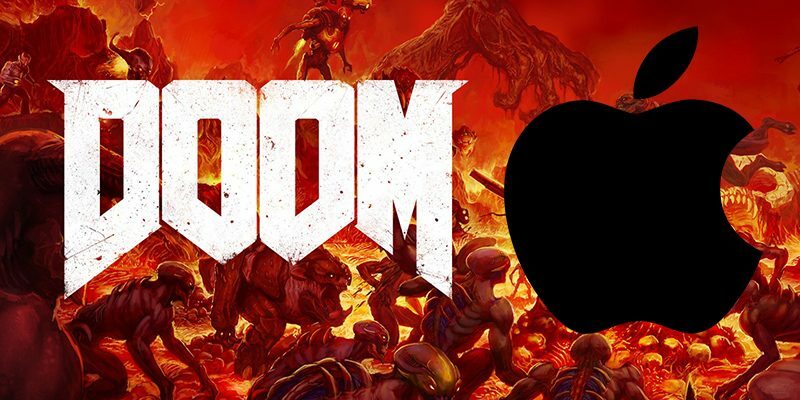 Doom never included a made on NeXT label, but Carmack did go on to work with Jobs on other projects. Jobs, said Carmack, didn't appear to "think very highly of games" and seemed to wish "they weren't as important to his platforms as they turned out to be." Carmack was asked to discuss gaming requirements with Apple, and ended up having "a lot of arguments" with Jobs over the adoption of OpenGL. Jobs was good at talking with "complete confidence" about things he was "just plain wrong about." Part of his method, at least with me, was to deride contemporary options and dare me to tell him differently. They might be pragmatic, but couldn't actually be good. "I have Pixar. We will make something [an API] that is actually good." It was often frustrating, because he could talk, with complete confidence, about things he was just plain wrong about, like the price of memory for video cards and the amount of system bandwidth exploitable by the AltiVec extensions. Carmack did convince Apple to adopt OpenGL, something Carmack says was "one of the biggest indirect impacts" on the PC industry that he's had, and he ended up doing several keynotes with Jobs. According to Carmack, keynotes were always a "crazy fire drill with not enough time to do things right." At one point, Jobs asked Carmack to do a keynote that was scheduled on the day of his wedding, with Jobs going as far as asking Carmack to reschedule the event, which Carmack declined to do. Carmack and Jobs' relationship began to fall apart after the launch of the iPhone, over a disagreement about web apps. Carmack was advocating for native apps while Jobs preferred web apps, leading to a heated dispute that later escalated when Carmack's comments were covered by the media. People were backing away from us. If Steve was mad, Apple employees didn't want him to associate the sight of them with the experience. Afterwards, one of the execs assured me that "Steve appreciates vigorous conversation". Still deeply disappointed about it, I made some comments that got picked up by the press. Steve didn't appreciate that. The Steve Jobs "hero / sh**head" rollercoaster was real, and after riding high for a long time, I was now on the down side. Someone told me that Steve explicitly instructed them to not give me access to the early iPhone SDK when it finally was ready. Carmack developed several now-defunct iOS games, the last of which was Rage for iOS, and while he had "allies" within Apple, he was "on the outs with Steve" and never again conversed with the Apple CEO. Carmack's full account of working with Steve Jobs, which can be found over on Facebook, is well worth reading for anyone interested in the history of Apple. My first impression of “Keynote Steve” was him berating the poor stage hands over “This Home Depot sh*t” that was rolling out the display stand with the new Mac, very much not to his satisfaction. His complaints had a valid point, and he improved the quality of the presentation by caring about details, but I wouldn’t have wanted to work for him in that capacity. I said that OS-X was surely being used for things that were more security critical than a phone, and if Apple couldn’t provide enough security there, they had bigger problems. He came back with a snide “You’re a smart guy John, why don’t you write a new OS?” At the time, my thought was, “F*ck you, Steve.”. The Steve Jobs “hero / s**thead” rollercoaster was real, and after riding high for a long time, I was now on the down side. Someone told me that Steve explicitly instructed them to not give me access to the early iPhone SDK when it finally was ready. Steve Jobs was always a prick. This is just more evidence of that. Who knew that Steve had so much in common with a lot of people around here. I've been around IT before it was called IT. The one thing that stands out in my experience is; marketing prevails over everything. Another-words, the loudest and most compeling "voice" wins even though there might be a better alternative. Bill Hicks' take on people in advertising and marketing has always been and still is spot on. Apple can't seem to do a damn thing right anymore when it comes to the Mac.... A $5000 iMac? Holy HELL Batman! To think you used to be able to get the cheese grater Mac Pro for $2000 with full internal expansion capability. Apple couldn't have screwed things up worse with that trash can Mac Pro if they tried. Yet we heard the Apple Kool-Aid stories then too! It's a beautiful trash can!!! (wish I could afford one or I'd buy ten!) I guess no one could afford one since they sold about as well as the Edsel. SJ: "Hey John, thanks for being a part of the Keynote..."
JC: "I think your iPhone strategy is a mistake. Your phone is going to fail unless you open up the platform so people can write proper apps for it." SJ: "We're not going to do that. We have to worry about security and we can't have a rogue app bring down a cell tower"
JC: "Well that's your own fault. If you guys knew how to write a proper OS to protect your baseband you wouldn't have to worry about such security issues!" SJ: "Well John, if you're so damn smart why don't you come work for me and show us how it's done?" JC: "Yeah but I want to launch and control my rockets from my phone"
SJ: "Well clearly the iPhone isn't meant for people like you"
It was absolutely incredible to be standing literally a 2 feet away from these two industry giants verbally slugging it out. I have a huge amount of respect for Carmack's technical acumen, and I think the part that surprised me most was how well Jobs was able to articulate his position and come back with pretty good responses to each criticism that Carmack brought up. There was so much else said, but I don't remember it all. In the end, SJ's assistant finally ended the thing by reminding him that he had to be somewhere. I remember saying to John after that, "Well, I guess that's the last time you're going to be invited to an Apple keynote" and he laughed "Yeah I guess so"
When the native app strategy was officially announced a few months later (Fall 2007? ), I wondered how much this particular conversation contributed to SJ's about-face on this issue. He was notorious for vigorously disagreeing with people, then going off and realizing he was wrong after thinking about it, only to come back and position it like it was his idea in the first place ;) There's no question in my mind that a native app strategy would have eventually unfolded, perhaps even on Android first if SJ had dug his heels in, but it's also clear that the iPhone would not have been the huge success that it has, had it not been for native apps launching the following summer. I wouldn’t think very highly of someone who had the arrogance to think I’d reschedule something of importance such as a wedding, in the way SJ. SJ was plain wrong on web apps back then. The iPhone wasn’t 3G, slow connection, and data plans expensive. Things are different now, much more mature, web apps work well. Native apps have their place, as do web apps. Good leaders are sometimes jerks. They have to be to get things accomplished. Driven geniuses and visionaries are only so because they are almost psychotically obsessive about their ideas.